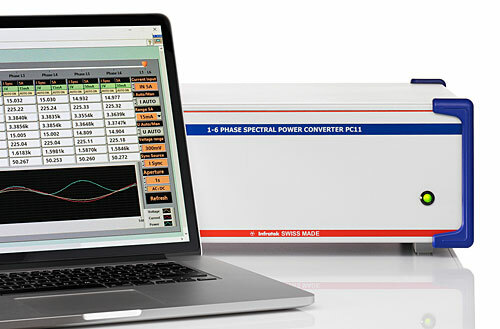 Infratek Switzerland has introduced its latest power analyser, the Power Spectral Converter PC11. This power analyser is available as three-, four- or six-phase version and is equipped with 0.08 % or 0.02 % accuracy. The PC11 is provided without display and therefore turns your computer into a power analyser, running on the PC11 software. Remarkable features are wide bandwidth (DC to 2MHz), wide current inputs 18 bit measurement resolution, calculates all quantities of power electronics, including motor and transformer values, harmonic, energies, analogue inputs and speed. Moreover, the concept of the instrument is extremely flexible and upgrading is feasible due to modular concept. The areas of application are versatile and find its place in inverter drive systems, electric motors, automotive, standby power and more. A high-speed data acquisition software is available for efficient production testing of 12 or more single phase apparatus.